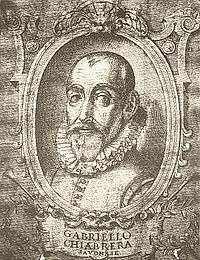 Gabriello Chiabrera (Italian pronunciation: [ɡabriˈɛllo kjaˈbrɛra]; June 8, 1552 – October 14, 1638) was an Italian poet, sometimes called the Italian Pindar. Chiabrera was of patrician descent, and was born at Savona, a little town in the domain of the Genoese republic, twenty-eight years after the birth of Pierre de Ronsard, with whom he has far more in common than with the great Greek whose echo he sought to make himself. As he has told in the pleasant fragment of autobiography prefixed to his works, in which, like Julius Caesar, he speaks of himself in the third person, he was a posthumous child; he went to Rome at the age of nine years, under the care of his uncle Giovanni. There he read with a private tutor, suffered severely from two fevers in succession, and was sent at last, for the sake of society, to the Jesuits' College, where he remained till his twentieth year, studying philosophy, as he says, "rather for occupation than for learning's sake." Losing his uncle about this time, Chiabrera returned to Savona, "again to see his own and be seen by them." In a little while, however, he returned to Rome, and entered the household of a cardinal, where he remained for several years, frequenting the society of Paulus Manutius and of Sperone Speroni, the dramatist and critic of Tasso, and attending the lectures and hearing the conversation of Mureto. His revenge of an insult offered him obliged him to betake himself once more to Savona, where, to amuse himself, he read poetry, and particularly Greek. The poets of his choice were Pindar and Anacreon, and these he studied until it grew to be his ambition to reproduce in his own tongue their rhythms and structures, and so to enrich his country with a new form of verse in his own words, "like his country-man, Columbus, to find a new world or drown." His reputation was made at once; but he seldom quit Savona, though often invited to do so, saving for journeys of pleasure, in which he greatly delighted, and for occasional visits to the courts of princes whither he was often summoned, for his verse's sake, and in his capacity as a dramatist. At the ripe age of fifty he took to himself a wife, one Lelia Pavese, by whom he had no children. After a simple and blameless life, during which he produced a vast quantity of verse — epic, tragic, pastoral, lyrical and satirical — he died in 1637, at the patriarchal age of eighty-five. An epitaph was written for him in elegant Latin by Pope Urban VIII, but on his tombstone are graven two quaint Italian hexameters of his own, in which the gazer is warned from the poet's own example not to prefer Parnassus to Calvary. A maker of odes in all their elaborate pomp of strophe and antistrophe, a master of new and complex rhythms, a coiner of ambitious words and composite epithets, an employer of audacious transpositions and inversions, and the inventor of a new system of poetic diction, it is not surprising that Chiabrera should have been compared with Ronsard. Both were destined to suffer eclipse as great and sudden as had been their glory. Ronsard was succeeded by Malherbe and by French literature, properly so-called; Chiabrera was the last of the great Italians, and after him literature languished till the second renaissance under Manzoni. Chiabrera, however, was a man of merit, apart from that of the mere innovator. Setting aside his epics and dramas (one of the latter received the honours of translation at the hands of Nicolas Chrétien, a sort of scenic du Bartas), much of his work remains yet readable and pleasant. His grand Pindarics are dull, it is true, but some of his Canzonette, like the anacreontics of Ronsard, are exceedingly elegant and graceful. His autobiographical sketch is also extremely interesting. The simple old poet, with his adoration of Greek (when a thing pleased him greatly he was wont to talk of it as "Greek Verse"), his delight in journeys and sight-seeing, his dislike for literary talk save with intimates and equals, his vanities and vengeances, his pride in the memory of favours bestowed on him by popes and princes, his infinita maraviglia over Virgil's versification and metaphor, his fondness for masculine rhymes and blank verse, his quiet Christianity, is a figure deserving perhaps of more study than is likely to be bestowed on that "new world" of art which it was his glory to fancy his own, by discovery and by conquest. Giambattista Marino was a contemporary of Chiabrera whose verses provide a comparison. 1 2 3 4 5 One or more of the preceding sentences incorporates text from a publication now in the public domain: Chisholm, Hugh, ed. (1911). "Chiabrera, Gabriello". Encyclopædia Britannica. 6 (11th ed.). Cambridge University Press. p. 117. Endnote: The best editions of Chiabrera are those of Rome (1718, 3 vols. 8vo); of Venice (1731, 4 vols. 8vo); of Leghorn (1781, 5 vols., 12mo); and of Milan (1807, 3 vols. 8vo). These only contain his lyric work; all the rest he wrote has been long forgotten. ↑ Smither, Howard E. A History of the Oratorio: Vol. 1: The Oratorio in the Baroque Era: Italy, Vienna, Paris Centuries. p. 155. Retrieved 2016-07-31.